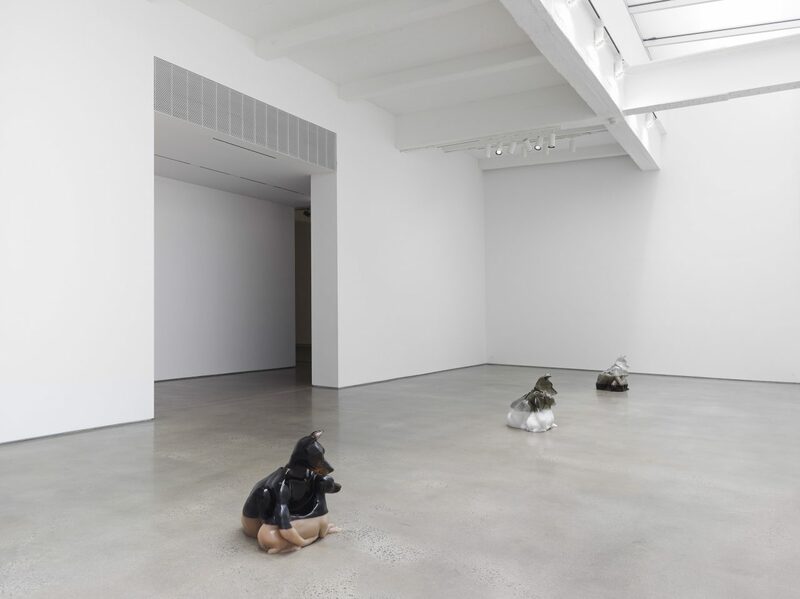 Oliver Laric premieres a new video animation in “Year of the Dog,” his first one-person exhibition in New York at Metro Pictures. The animation continues his inquiry into concepts of metamorphosis, encompassing concerns about time and the complex dynamic between human and nonhuman lifeforms. Against a white background, linear animations of fish, fungi, and other figures move and change shape. The lines composing the animations continually extend or contract to zoom in on greater and greater detail, magnifying a sense of time as the images change. 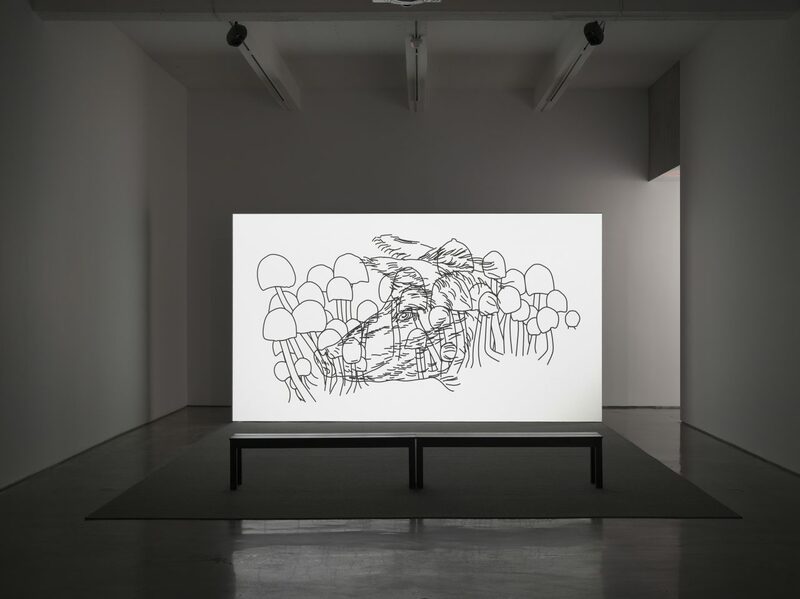 While the shapes and figures, as in his previous video works, are drawn from cartoons and Japanese anime, Laric’s subject matter has grown to also include animations based on live footage. He constructed the animation via an exacting technique in which each line moves continually between sequences—in contrast with traditional techniques in which each sequence consists of a series of redrawn frames. As the shapes perpetually transform, an atmospheric soundtrack commissioned from musician Ville Haimala establishes the sense of an unfolding narrative. The back gallery is devoted to three sculptures, all titled Hundemensch, cast in resin from the same mold. 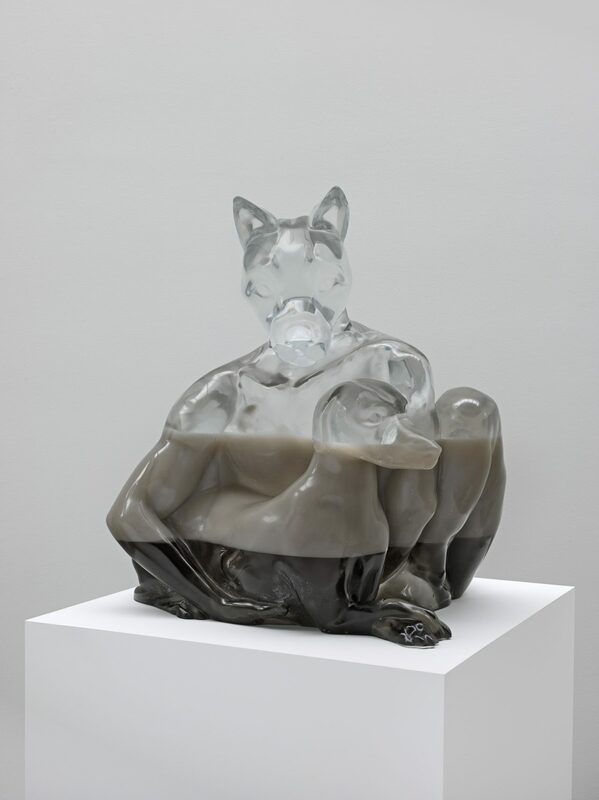 Distinguished by their color and varying degrees of transparency and opacity, each sculpture consists of a figure with the head of a dog and body of a human who crouches down, holding a smaller dog protectively in its arms. Outlines of a human ear, a frog, a salamander, and a crab are visible beneath the surface of the figures’ transparent muscular backs. 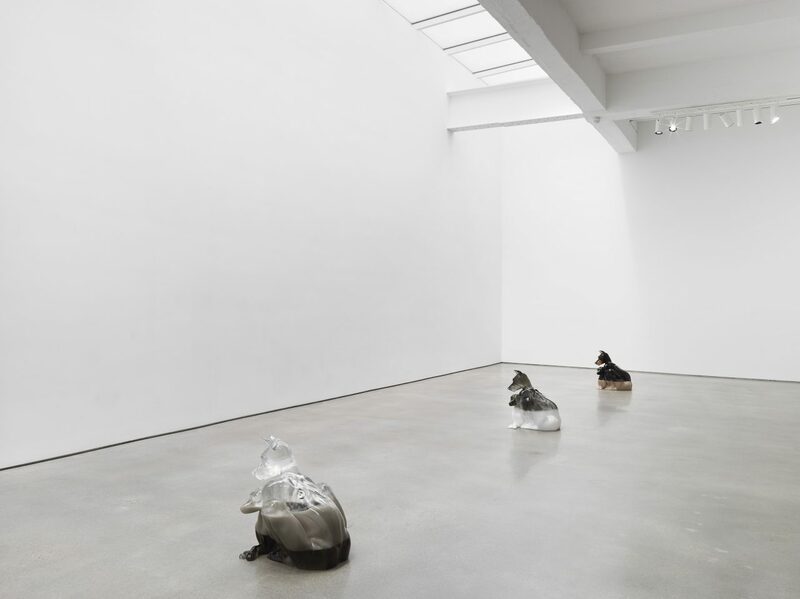 Unlike many of his previous works, these forms are not generated from an existing sculpture. Instead, Laric executed drawings based on a variety of anthropomorphic figures dating from prehistory to the 19th century. 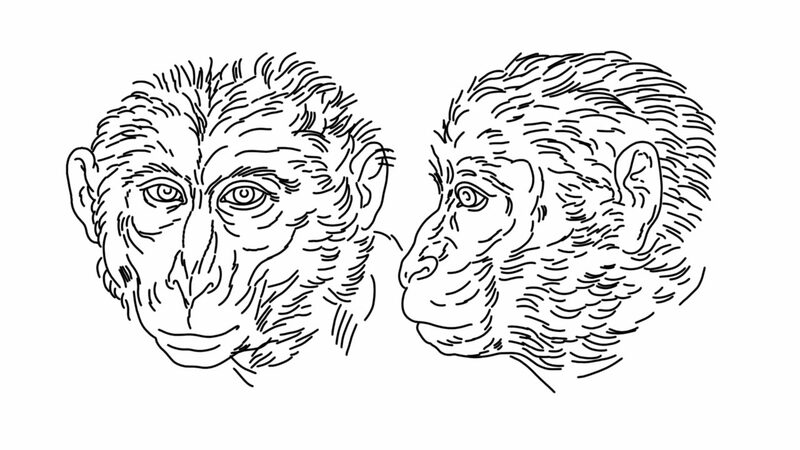 The artist then translated these drawings into a 3D model that was used to cast the sculptures. 20 7/8 x 20 1/2 x 22 13/16 inches, 53 x 52 x 58 cm.